The driveway is one of the first things people see from the outside of your home. So with that being said, it’s important that your driveway is clean. In this week’s blog, we share our top tips on cleaning your driveway. The first thing you want to do before cleaning your driveway is to clear the space of any toys, vehicles or other objects which might get in the way. Also, make sure there’s no safety hazards which could hurt you in the cleaning process. Now, you want to attach the garden hose and the 25-degree nozzle. Turn the hose on and lightly brush your driveway over with the hose to remove loose debris such as sticks, grass, pebbles and any other small leaves or branches. After this, apply detergent to the driveway. It’s crucial that the detergent is driveway friendly. Make sure to research, which driveway cleaners work best with your driveway material and climate. 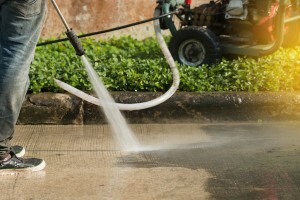 Attach the soaping nozzle at this stage, which is designed to soak the driveway as opposed to blasting it clean. Allow the detergent to soak the driveway for approximately five minutes. This will help remove any tough stains and dirt. Once you’ve let the detergent work its magic on your driveway, you need to blast it all away. A surface cleaner attachment is great for this as it will complete the clean more efficiently and effectively. A rotary nozzle is also another great option. Rotary nozzles are excellent for removing stubborn stains as they push the dirt and grime from the surface. The driveway should now be clean. Finish the task by giving your driveway a final rinse to remove any remaining detergent. At A Better Driveway, we provide distinctive, durable and affordable driveway solutions. From exposed aggregate to coloured and textured concrete, we have a range of styles to suit your aesthetic and budget. Please do not hesitate to call us on (03) 9308 6112 for more information or to receive a quote.